This is the last box from my year long subscription. Getting a year subscription gives you a savings of $4 per box, a total of 4 boxes. 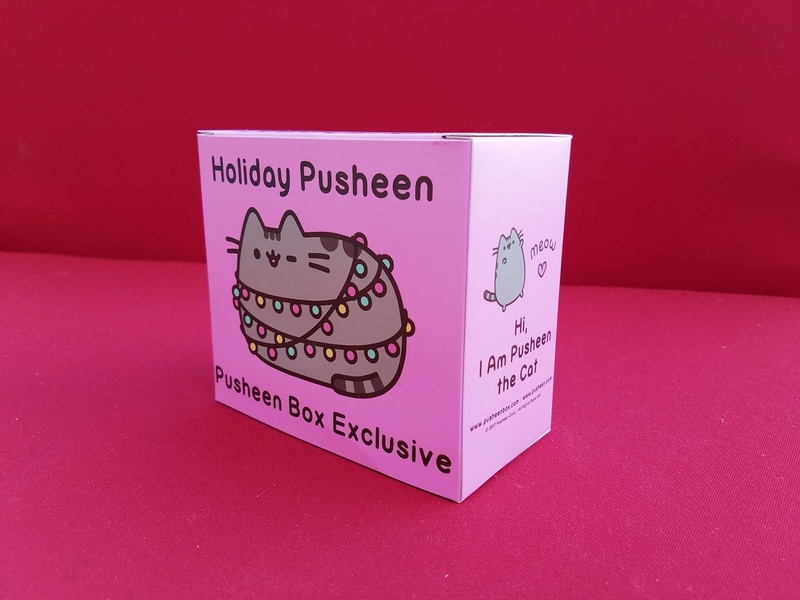 I think the boxes are totally worth it but this will my last box for a while as I have already gotten a total of six Pusheen boxes. My favorites are usually the Spring and Fall box. If they reveal some nice spoilers for the next Spring box, I may get one more. Unfortunately, this winter box was disappointing. I feel that their quality has been declining. 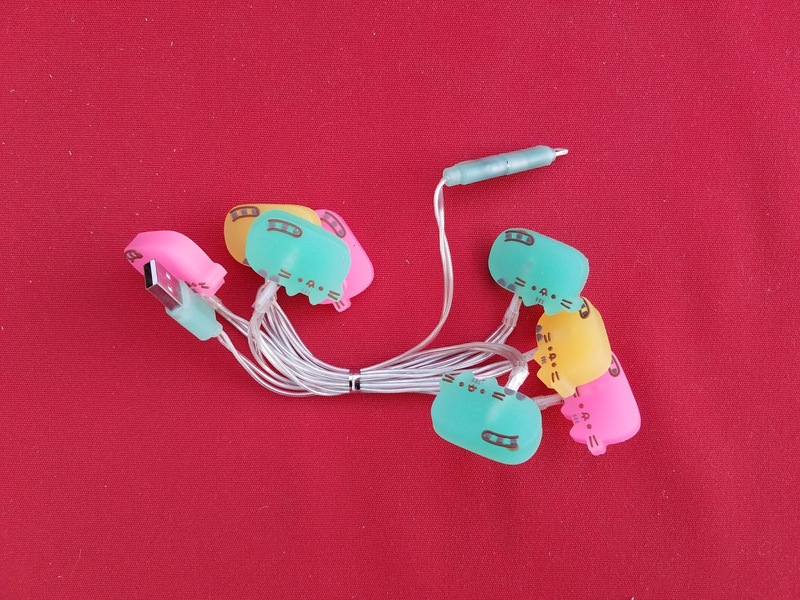 I'm assuming they collaborate with a company in China to manufacture these exclusive items. 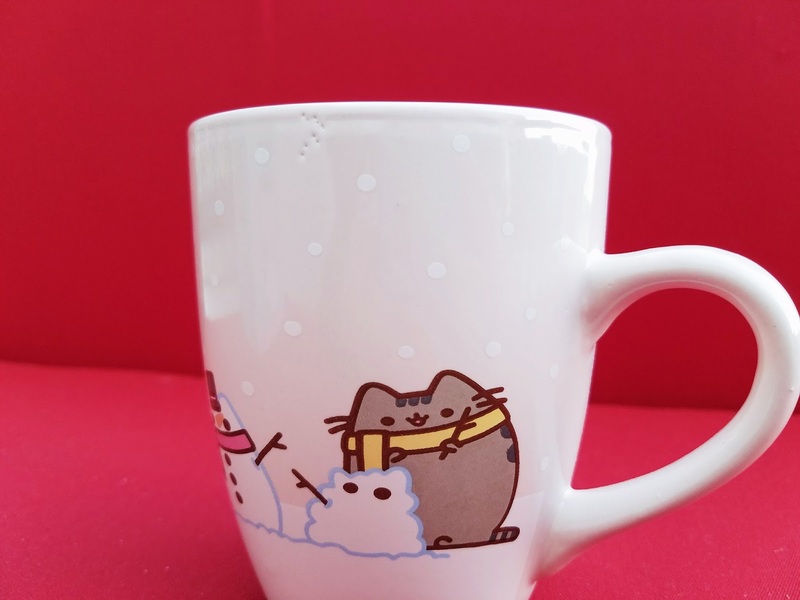 I feel some of the items really lack the quality you see in the Pusheen brand. It's mostly the electronics that I do not trust. 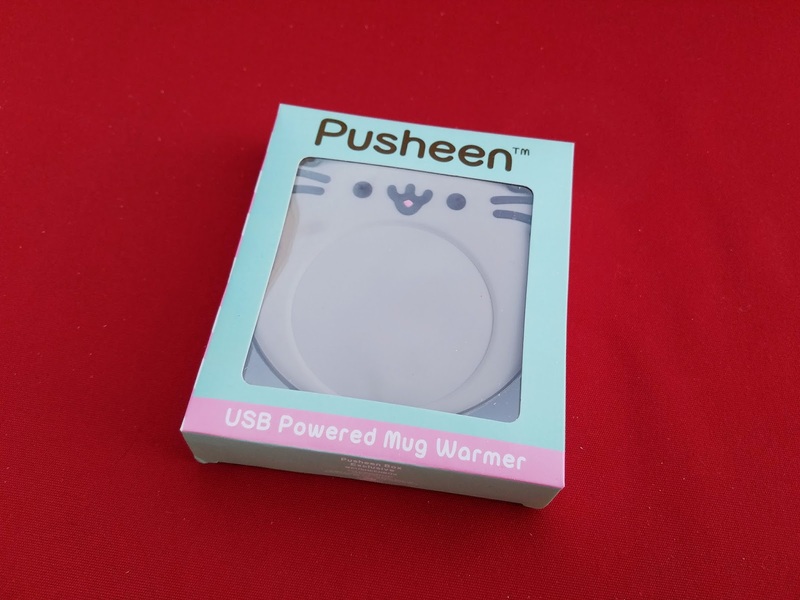 The Pusheen bluetooth speakers I received in the summer stopped working after one use. 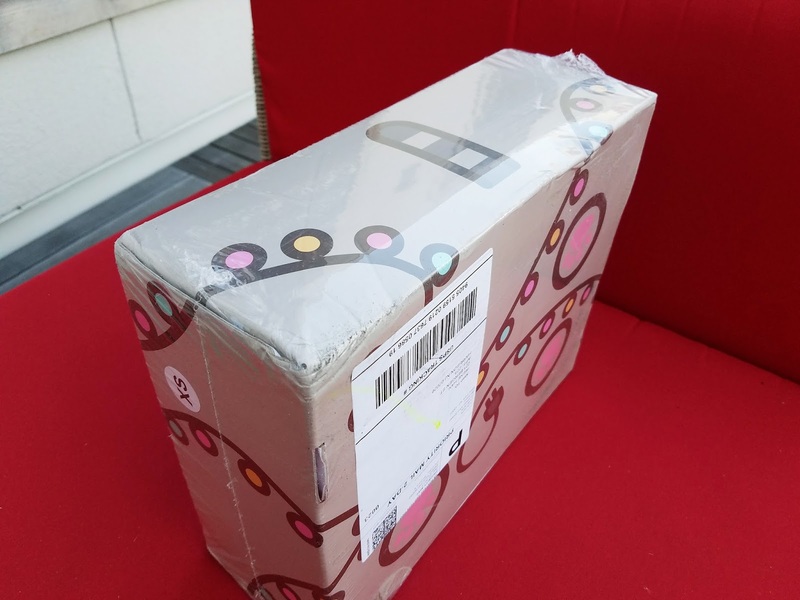 The previous packages have been arriving in pretty good condition. This time the box is a little dinged up and the back is also a bit crushed. Usually the boxes have been able to withstand pressure so I'm not sure why this box feels a little weaker. Maybe I just got unlucky. 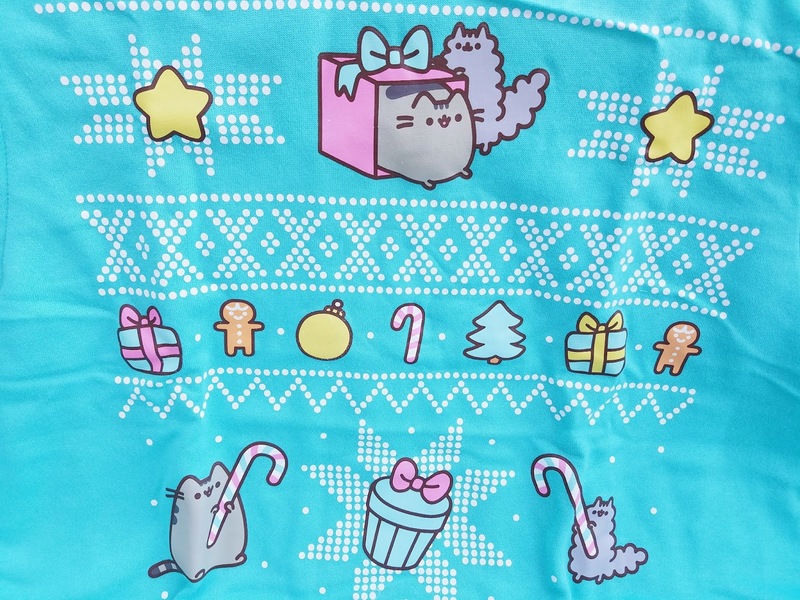 I love the winter design this time with colorful string lights wrapped around Pusheen. 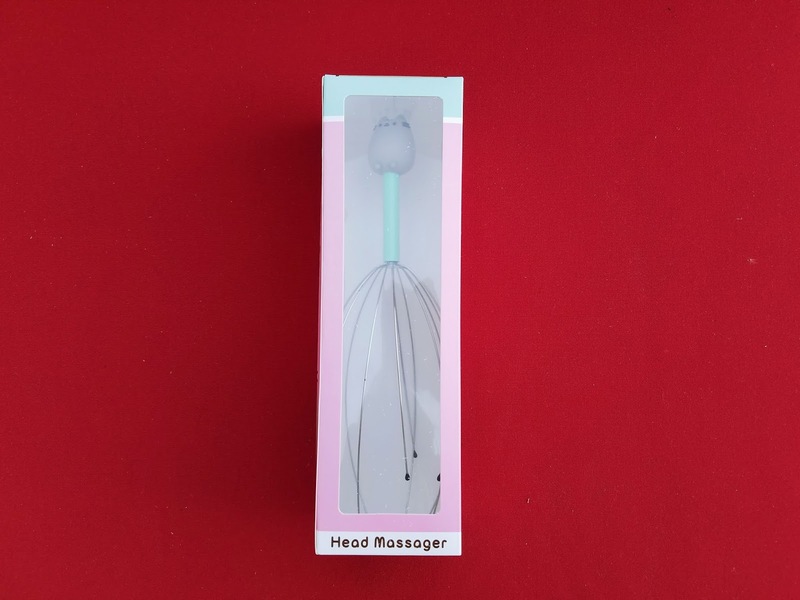 The first thing I noticed in the box was this head massager. 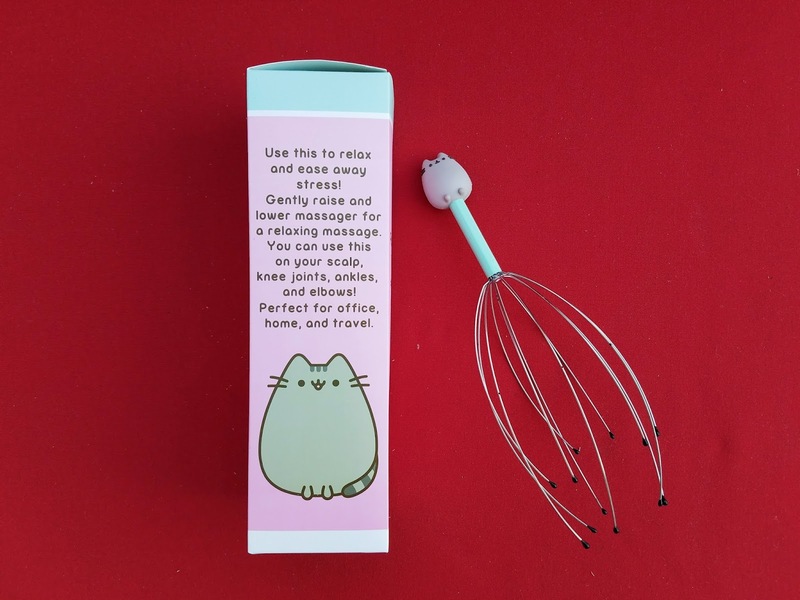 At first I was excited because I thought it was a cooking wisk, but to my surprise it was one of those cheap, useless home appliances. This is just my opinion but this is a really odd and random item to add to the box. I feel they just added it because it's inexpensive to manufacture. 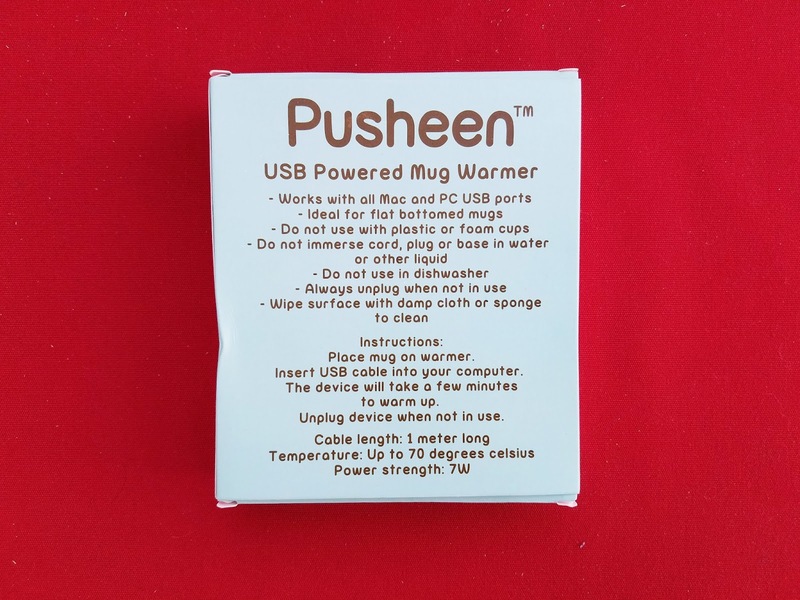 When I saw there was a mug I thought that made a lot of sense to put in the winter box. When I took it out I was shocked at the quality. 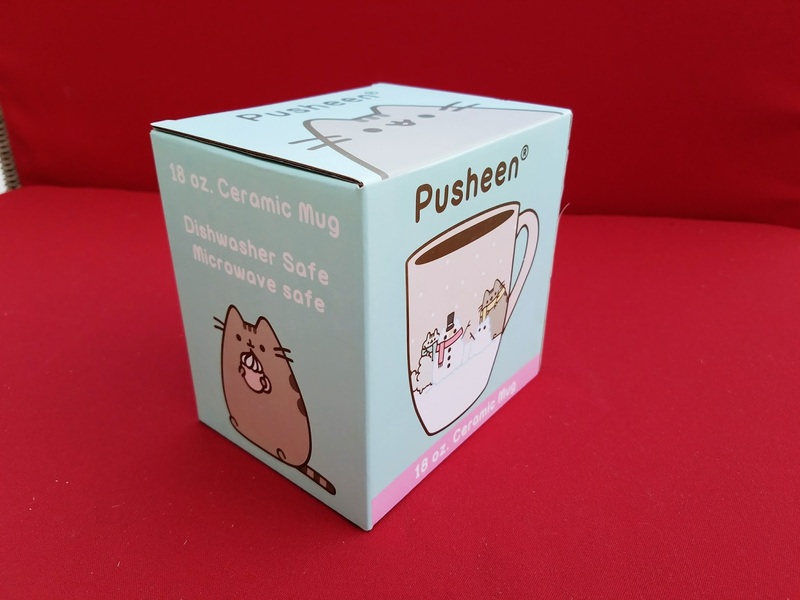 Pusheen brand mugs are usually high quality and I've also received a really nice teacup with saucer set in the Fall 2016 box. 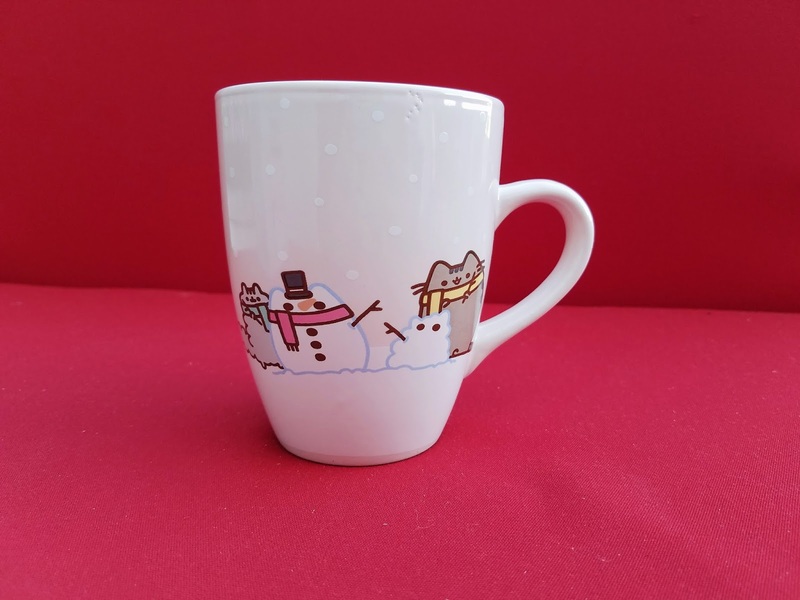 This mug you can tell was a really bad screen print job. The colors are muted and the image looks warped. 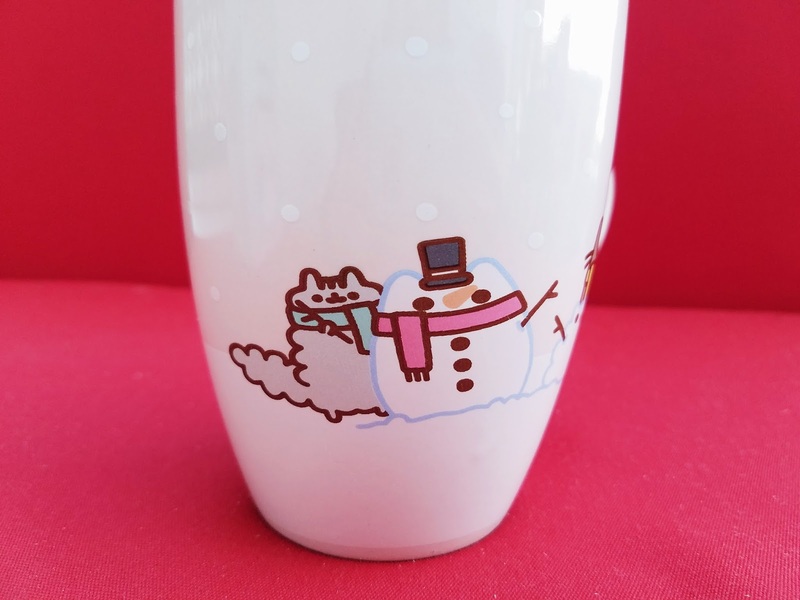 There is also some imperfections on my the mug, some dots on the top of the mug. 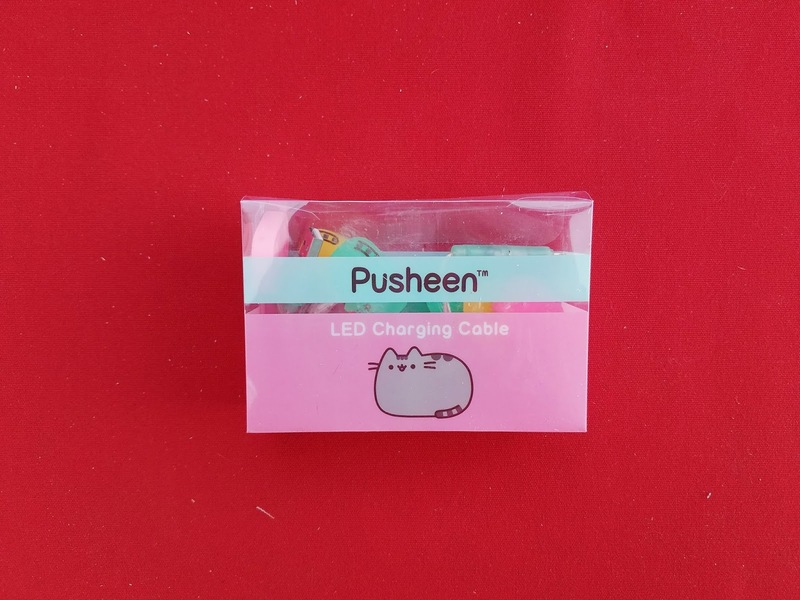 This is a USB charging cable. Another cheap elecrontic appliance. 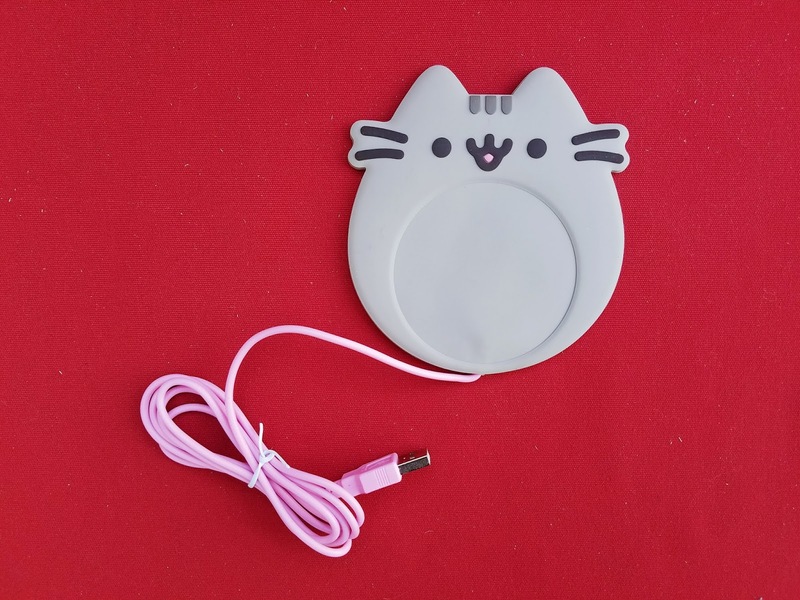 It's cute but has unnecessary string light clutter just to charge a phone or tablet. I'm sure it's a cheap cable so I won't be surprised if it stops working. Yet another cheap appliance. While the concept is cute, I feel that it will not work well. 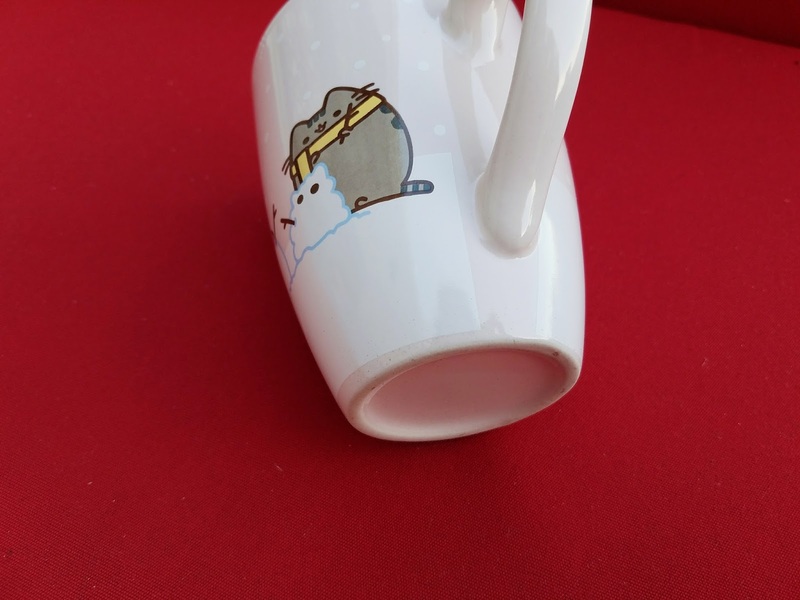 I don't feel like keeping it so I won't test it out but I can't imagine it would really keep a drink warm that well. Another novelty item. I thought this was a cute a little addition. 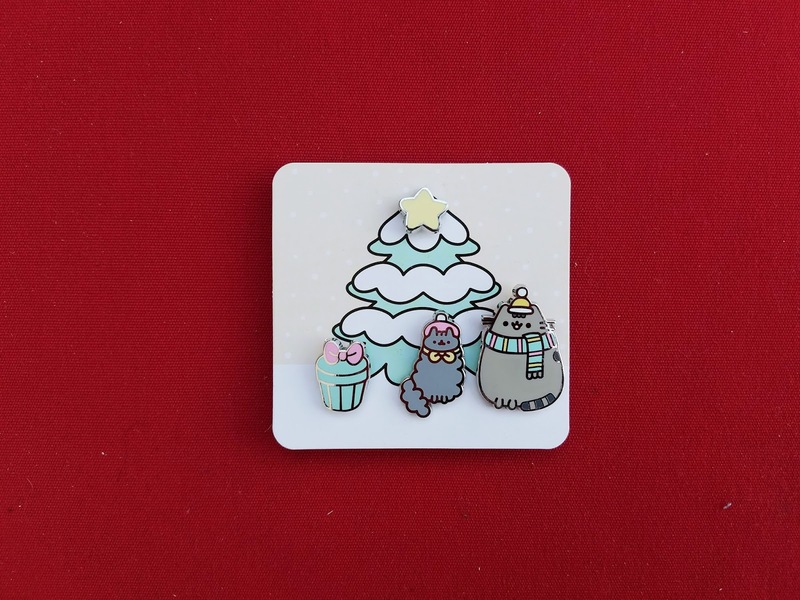 There are 4 small pins, a yellow star, a present, Pusheen, and stormy. Great for pin collectors. Stationary is always nice to receive in the box. 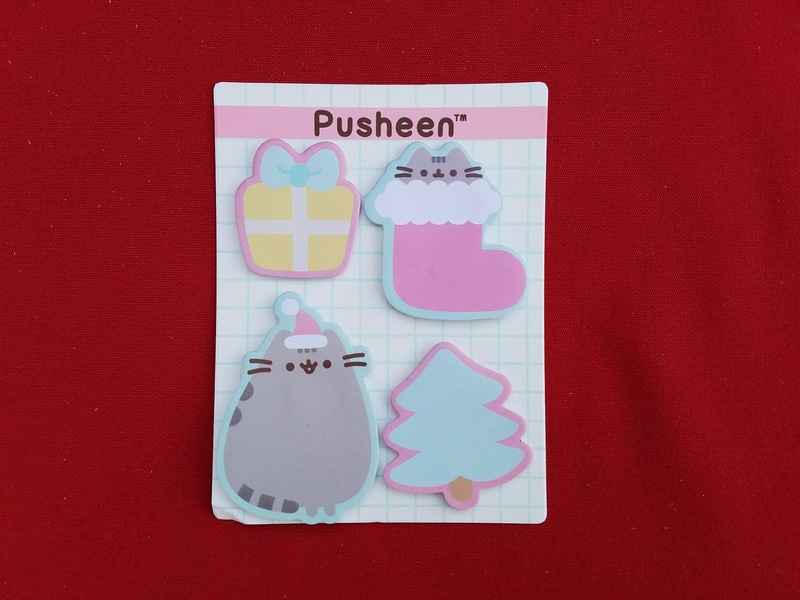 These are holiday themed sticky notes. Although I feel the paper quality is not as nice as previous stationary I have received from Pusheen. This sweatshirt probbably makes up for how much this box is lacking. I've always wanted a holiday sweater, perfect to wear to a holiday party! 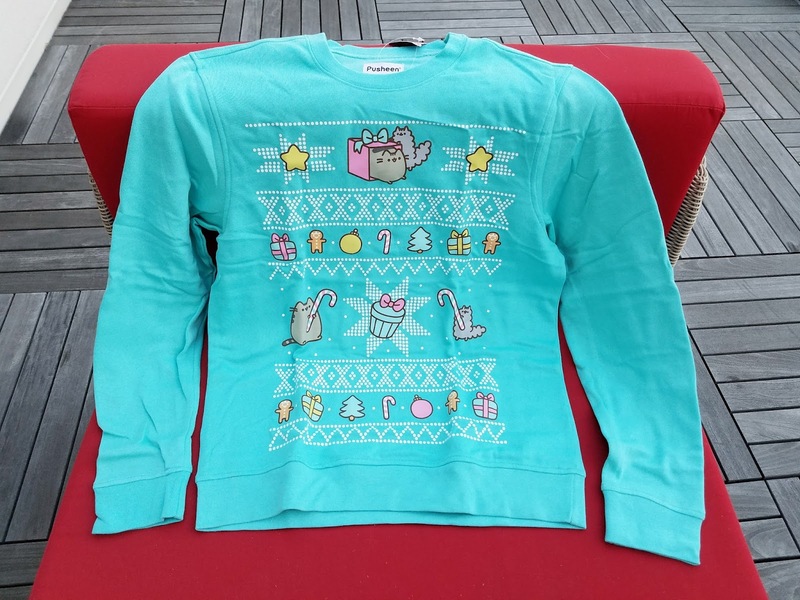 It features a design with Pusheen, Story, presents, tree, gingerbread man, stars, candycane, and ornaments on a Bright Turquoise sweater. The quality is as good as their previous sweatshirts. 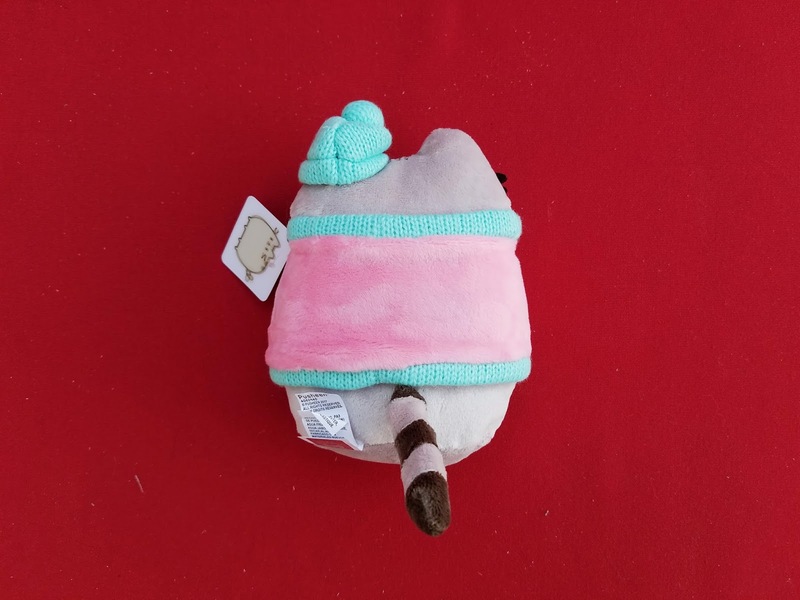 This time we receive a winter themed plushie. 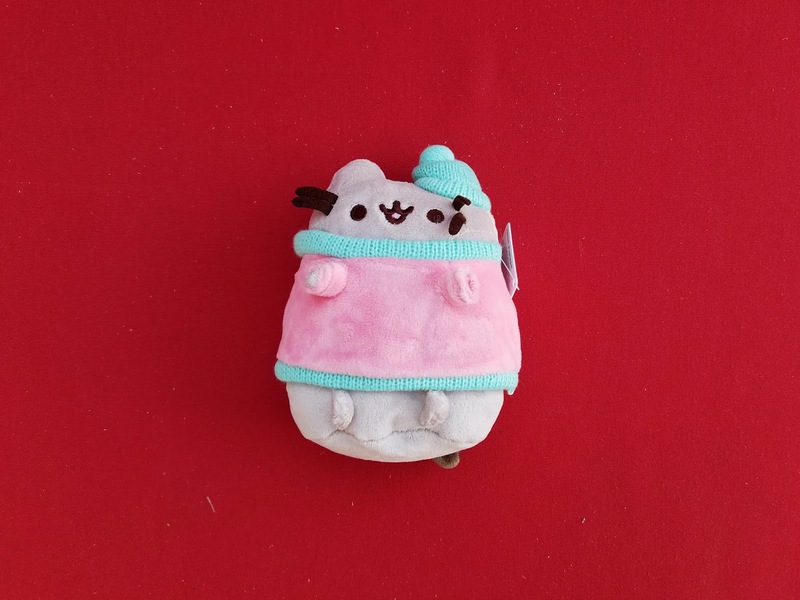 Pusheen is wearing a hat and sweater. I'm a little surprised this boxes gave a sweater and a plushie since the Fall box also had these two items. It should be a little more spread out. It's like they are running out of ideas. 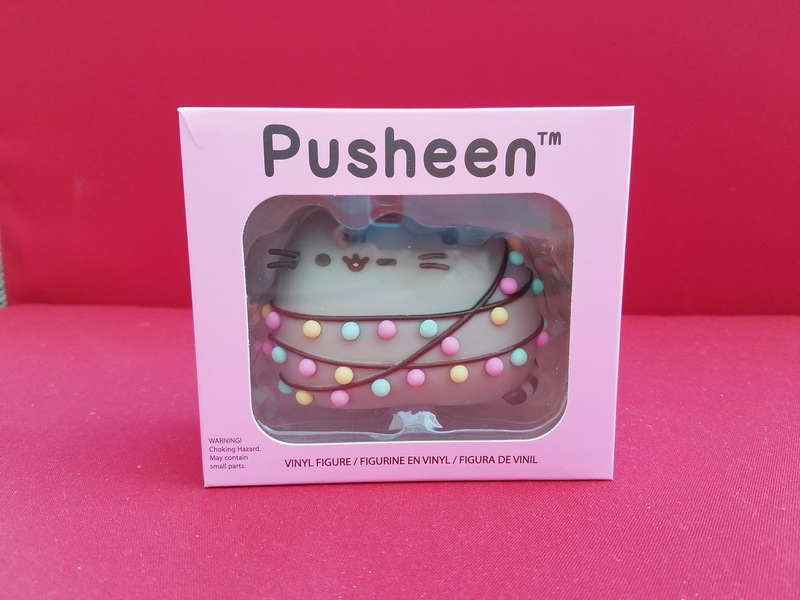 The exclusive vinyl figure is a super cute Pusheen wrapped around in string lights. Love the concept. Overall, I was not impressed at all with this box. Usually I like and keep half the things in the box but this time I only like one or two things. 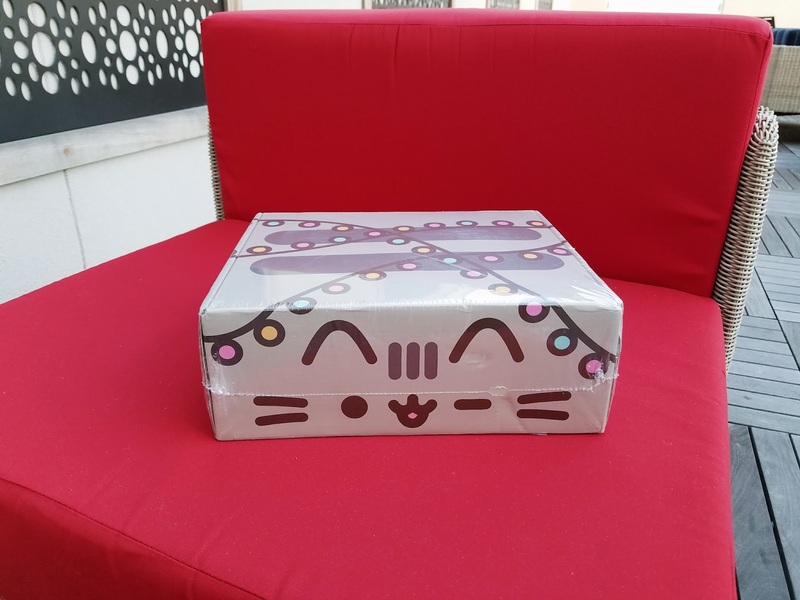 I do not want this box to affect how I review Pusheen box as a whole. 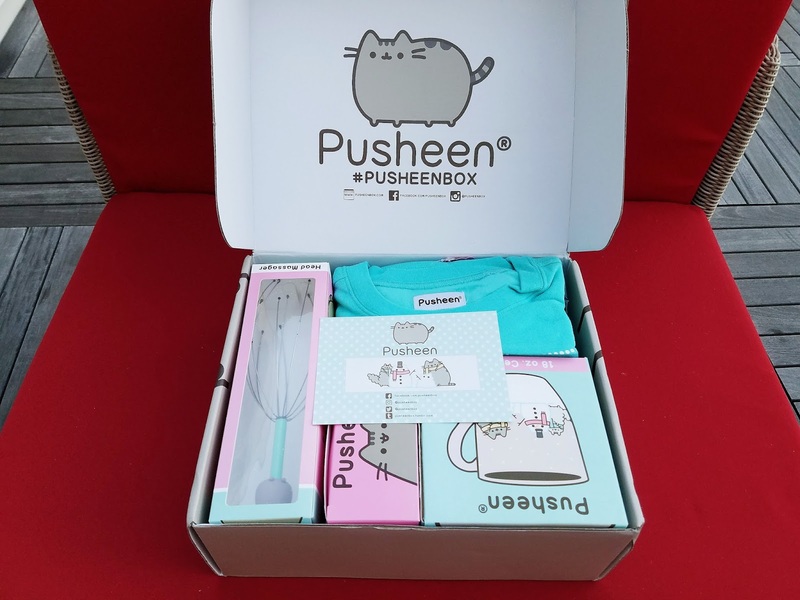 I have been getting the Pusheen box since Summer 2015 box. 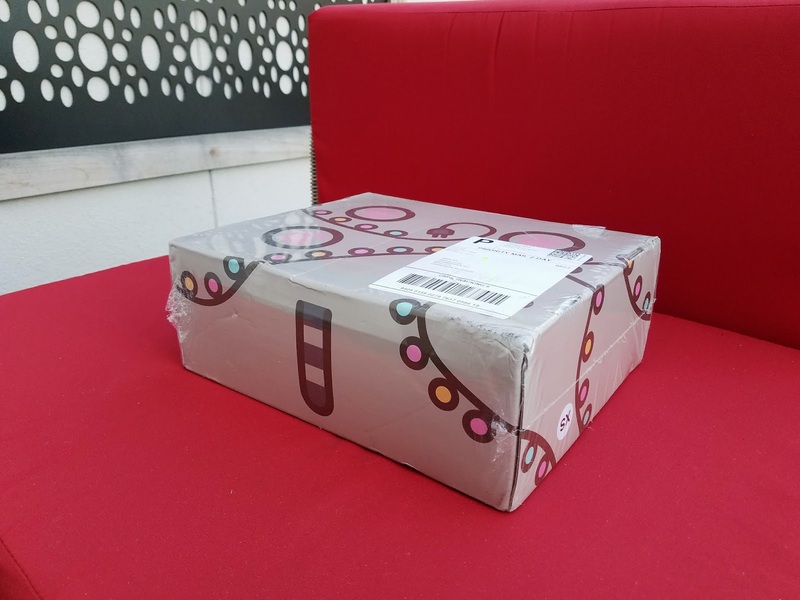 I've always been very excited to receive each box and very satisfied with the products. Some people think the box is expensive but the amount of things you get is definitely worth more than the price of the box. I just think the more recent boxes with electronic items are not worth it. I think they are filling the boxes with them and cutting costs. 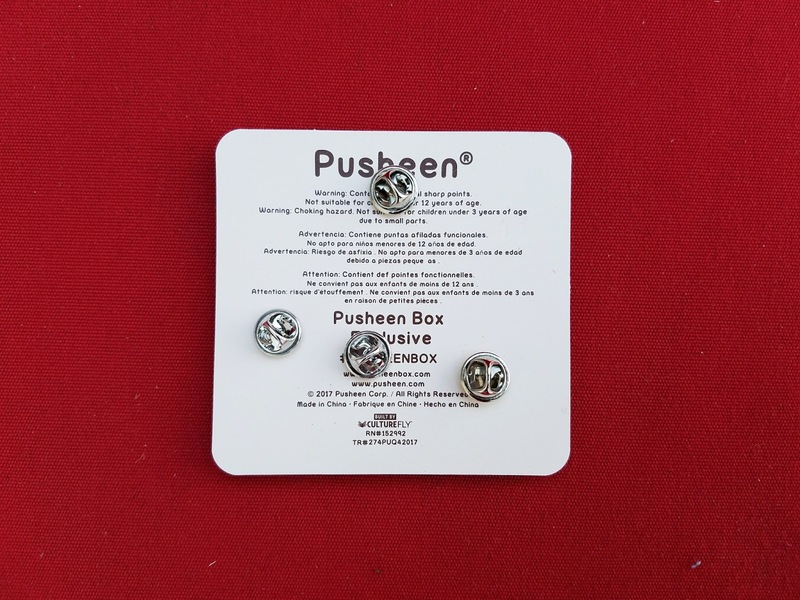 If they can keep their quality consistent I would highly recommend the Pusheen box to Pusheen fans.